Lego leaps through the agility course. 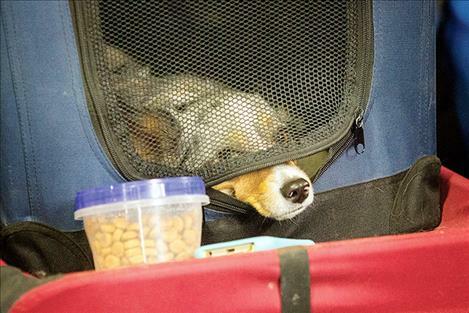 Tempting treats catch Squirt's attention as he takes a break from competition. Aspen McKee rewards Tickle for a clean run. 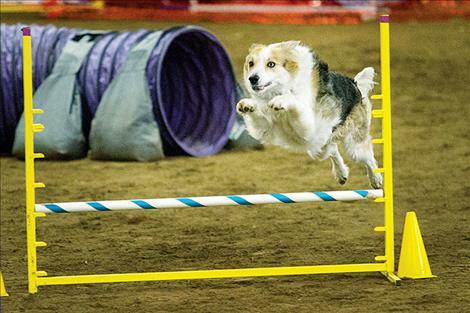 Paws were put to the test, as canines of all shapes, sizes, colors and breeds zipped, zig-zagged and zoomed through and over various obstacles this past weekend during the Agility by the Lake Trials. 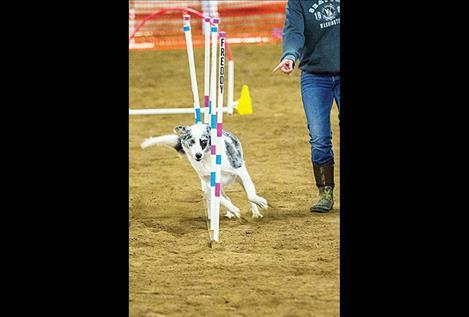 The North America Dog Agility Council (NADAC) sanctioned event, sponsored by the Missoula-based club A Rover Runs Through It (ARRTI), featured about 50 dogs Friday through Sunday at the Milliron Arena. Dog agility requires dogs to negotiate a numbered obstacle course with their human teammates to guide them around courses in the fastest time possible, without making any mistakes. Obstacles include jumps, hoops, turns, tunnels and ramps. Mesa Bryn McKee, a sophomore at Polson High School, brought her eight-year-old border collie Lego to the event to work on collecting qualifying points for the NADAC Championships which will be held in Gillette, Wyoming Sept. 25-30. 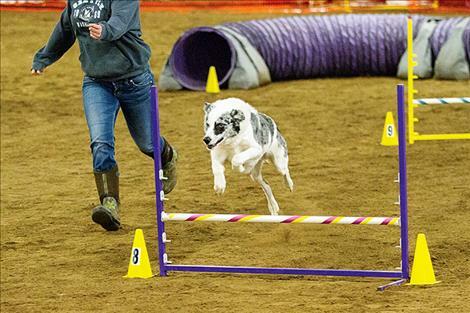 McKee’s interest in dog agility grew from participating in 4-H dog projects for the last six years. “This is a lot of fun and the atmosphere is really friendly,” McKee said. Dogs and handlers undergo hours of training to become prepared for the event. The event was not limited to any sort of breed, while some breeds may have aptitudes more agile than others, all breeds are welcome to compete. 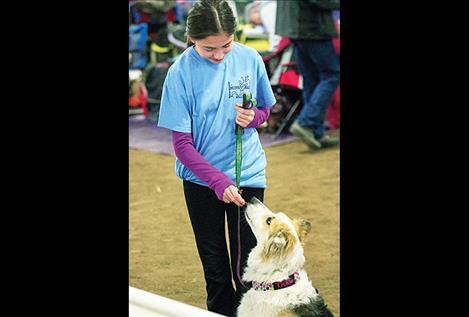 Although ARRTI hosted the trials, 4-H dog project leader Karen McLeod and her group of kids where very instrumental in bringing the event to Polson.